Do those armor piercings come with the figures in the BP? Yea, and they’re not removable. These are some of the better looking colored clones out the entire line. Hey Niktom, where’d you get those blocks for the wall? Those are from the Battleground: Crossbows and Catapults Game. I really like the poses on the figures. It implies so much movement and action. But what I like the best is the way the wall pieces evoke the climactic battle in the movie Time Bandits, where the castle stones intentionally resemble gigantic Lego pieces. 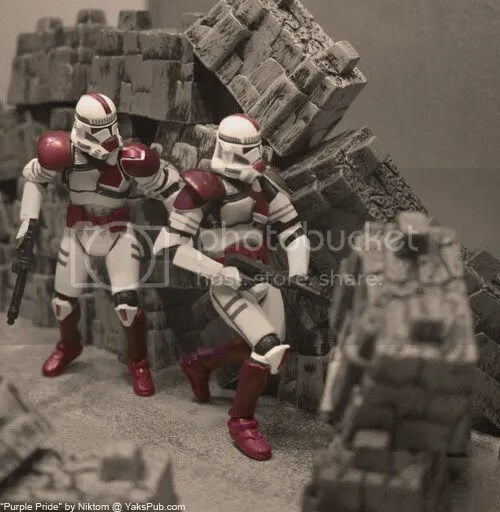 Are these clone soldiers real people, are they toys, are they something in between? This pic is surprisingly deep.